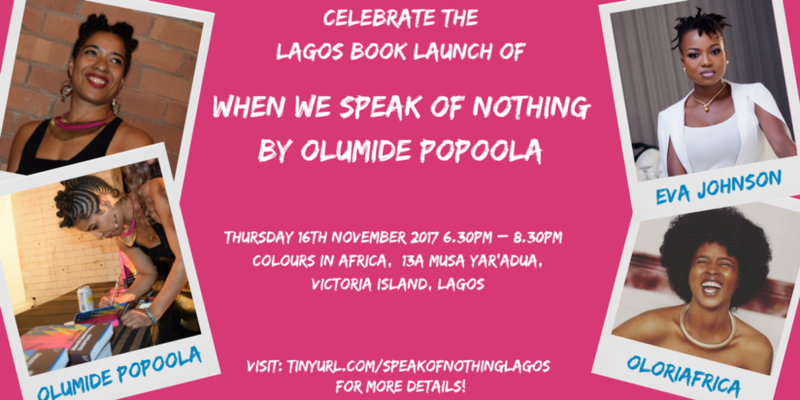 After series of successful launch events across Europe, Cassava Republic Press is proud to announce that it will be hosting the Nigerian launch of Olumide Popoola’s debut novel – When We Speak of Nothing. Where: Colours in Africa, 13a Musa Yar’Adua Street off Idowu Martins Street, Victoria Island, Lagos. Escape the Lagos rush hour traffic for an evening of reading, conversation, music and poetry and more as Olumide Popoola transports us to the sound of London and Port Harcourt in her brilliant debut about friendship, loyalty, parenting, bullying and gender identity in the digital age. And since we are talking youth, talent and voice, the sensational Afro-soul singer, OloriAfrica will perform her magic on drums and the fiery spoken performance poet, Eva will prepare us for the weekend. Peppered with contemporary slang, When We Speak of Nothing has enjoyed positive reviews for its brilliant exploration of friendship, loyalty, race and gender identity in the digital age. The book follows the lives of two teenage best friends, Karl and Abu, who are caught up in the Niger Delta and London crisis, respectively – while still learning so much more about themselves and the world they live in. In the mean time, you can read our review here, and/or our interview with Ms Popoola here.